Using freedom of information legislation — or wobbing, as it is sometimes called — is an excellent tool. But it requires method and, often, persistence. Here are three examples illustrating the strengths and challenges of wobbing from my work as an investigative journalist. 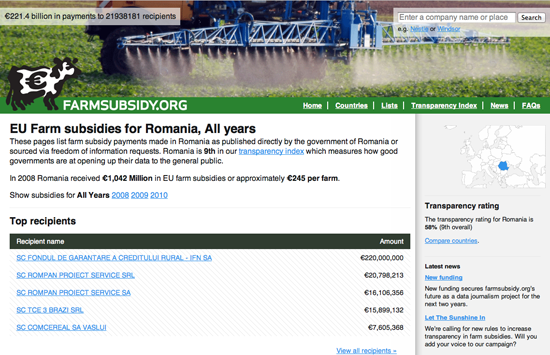 Every year EU pays almost €60 billion to farmers and the farming industry. Every year. This has been going on since late 1950s and the political narrative was that the subsidies help our poorest farmers. However a first FOI breakthrough in Denmark in 2004 indicated that this was just a narrative. The small farmers were struggling as they so often complained about in private and in public, and in reality most of the money went to a few large land owners and to the agricultural industry. So obviously I wanted to know: is there a pattern across Europe? In the summer of 2004 I asked the European Commission for the data. Every year in February the Commission receives data from the member states. The data shows who applies for EU funding, how much beneficiaries get, and whether they get it for farming their land, developing their region or for exporting milk powder. At that time, the Commission received the figures as CSV files on a CD. A lot of data, but in principle easy to work with. If you could get it out, that is. In 2004 the Commission refused to release the data; the key argument was that the data was uploaded into a database and couldn’t be retrieved without a lot of work. An argument, that the European Ombudsmand called maladministration. You can find all documents in this case on the wobbing.eu website. Back in 2004 we did not have the time to be legal foodies. We wanted the data. So we teamed up with partners throughout Europe to get the data country by country. English, Swedish and Dutch colleagues got the data in 2005. Finland, Poland, Portugal, regions of Spain, Slovenia and other countries opened up in the too. Even in wob-difficult Germany I got a breakthrough and received some data in the province of North Rhine-Westfalia in 2007. I had to go to court to get the data — but it resulted in some nice articles in the Stern and Stern online news magazine. Was it a coincidence that Denmark and the UK were the first to open up their data? Not necessarily. Looking at the bigger political picture, the farm subsidies at the time had to be seen in the context of the WTO negotiations where subsidies were under pressure. Denmark and the UK are amongst the more liberal countries in Europe, so there may well have been political winds blowing into the direction of transparency in those countries. The story did not stop there, for more episodes and for the data see farmsubsidy.org. Lesson: Go wob-shopping. We have a fabulous diversity of freedom of information laws in Europe, and different countries have different political interests at different times. This can be used to your advantage. We are all guinea pigs when it comes to taking medicine. Drugs can have side-effects. We all know this, we balance potential benefits with potential risks, and we make a decision. Unfortunately often this decision is not an informed decision. When teenagers take a pill against pimples they hope for smooth skin, not for a bad mood. Yet exactly this happened with one drug, where the youngsters turned depressive and even suicidal after taking it. The danger of this particular side effect — an obvious story for journalists — was not easily available. There is data about side-effects. The producers regularly have to deliver information to the health authorities about observed side-effects. They are held by national or European authorities once a drug is allowed on the market. The initial breakthrough again came at national level in Denmark. During a cross-border research by a Danish-Dutch-Belgian team, the Netherlands opened up too. Another example of wob-shopping: it greatly helped our case to point out to the Dutch authorities that the data was accessible in Denmark. But the story was true: in Europe there were suicidal young people and sadly also suicides in several countries as a result of the drug. Journalists, researchers, and the family of a young victim were all pushing hard to get access to this information. The European Ombudsman helped to push for the transparency at the European Medicines Agency, and it looks, as if he succeeded. So now the task is upon journalists to get out data and analyze the material thoroughly. Are we all guinea pigs, as one researcher put it, or are the control mechanisms sound? Lessons: Don’t take no for an answer when it’s about transparency. Be persistent and follow a story over time. Things may well change and allow better reporting based upon better access at a later point. Recent history can be utterly painful for entire populations, particularly after wars and in times of transition. So how can journalists obtain hard data to investigate, when — for example — last decade’s war profiteers are now in power? This was the task that a team of Slovenian, Croatian and Bosnian journalists set out to pursue. The team set out to investigate arms trades in former Yugoslavia during the UN embargo in the early 1990s. The basis of the work were documents from parliamentary inquiries into this subject. In order to document the routes of the shipment and understand the structure of the trading, transports had to be traced by vessel number in ports and license plates of trucks. Slovenian parliamentary commissions have held inquiries into the question of profiteering from the Balkan wars, but have never reached a conclusion. Yet there was an extremely valuable trail of declassified documents and data, including 6000 pages which the Slovene team obtained through a freedom of information request. In this case the data had to be extracted from the documents and sorted in databases. By augmenting the data with further data, analysis and research, they were able to map numerous of the routes of the illegal weapon trade. The team succeeded and the results are unique and have already won the team their first award. Most importantly the story matters for the entire region and may well be picked up by journalists in other countries through which the deadly cargo has passed. Lessons: Get out good raw material even if you find it in unexpected places and combine it with existing publicly accessible data.